Following on from the introduction of Agency Plans we’ve got some further tweaks to our plan pricing and some small modifications to our Premium Plan. Annual plans are something we have wanted to release for quite a while but were one of those things we never did. It’s something we get asked for on a semi-regular basis and in the past, we have just created yearly custom plans for those that ask. In planning for the introduction of annual pricing we’ve done some research into what other SaaS companies offered regarding an incentive for annual customers. The vast majority provided roughly two months free (or around 20% off compared to paying by the month). While this was appealing, it didn’t feel like the right fit for Fuzed. We wanted to reward customers who choose to put their faith in Fuzed by committing to 12 months at a time. In putting that confidence in us, it allows us to plan better and invest in resources to continue improving Fuzed through additional integrations and refining existing ones. We decided that this faith was worth more than just a few months free. We settled on a 40% saving compared to paying by the month. You can view the yearly (and monthly pricing) here. …while our Premium Plan allowed an unlimited amount of live Fuzes there was just one active customer that had more than 50 live fuzes running. That stunned us. We decided to make a change that would benefit the majority of our clients. 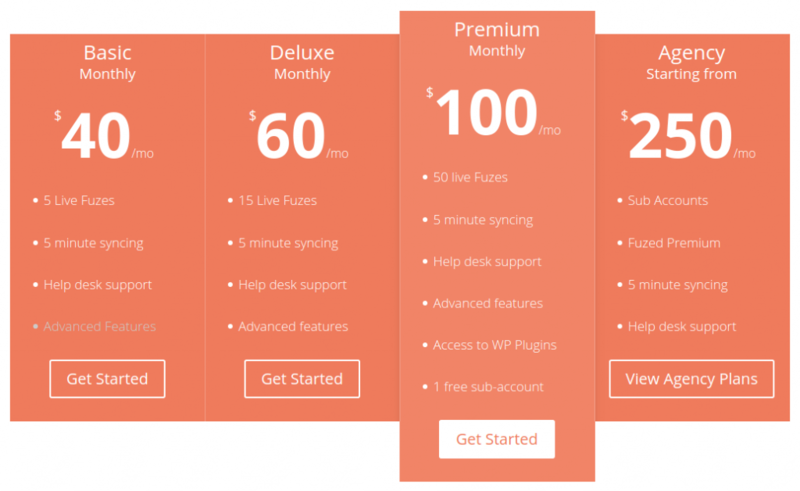 … we’ve included one free sub-account for Premium users. That sub-account is the equivalent of a having a second fully functioning Premium account. For those who require more than 50 live fuzes, it is still possible; they just need to reach out to us for custom pricing. We have updated our pricing to make it simpler and a little more “rounded”. Throughout the internet wherever you see prices you will often see a 7 or a 9 at the end. Instead of $40 it would be either $37 or $39. Instead of $100 it would be $97 or $99. There have been numerous studies done that show the power of using 7s and 9s at the end of your prices. Most of the studies show a decent bump in sales when using them. 7s & 9s have never sat well with me. When I see $97, I immediately think $100 nevertheless. There has been a trend of late of SaaS companies switching back to more rounded pricing, and I appreciate seeing it. Wistia is a great example, as is Masterclass. I feel it builds trust. So we have followed in their footsteps and changed our monthly pricing to simple round numbers. More announcements are on the way (including an excellent little short term added incentive to switch to annual pricing, which I’ll be revealing tomorrow).